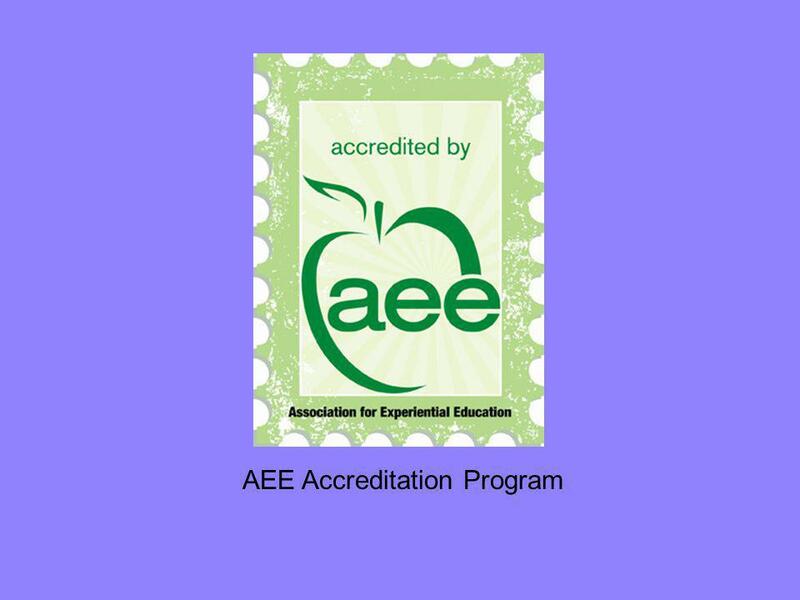 AEE Accreditation Program. 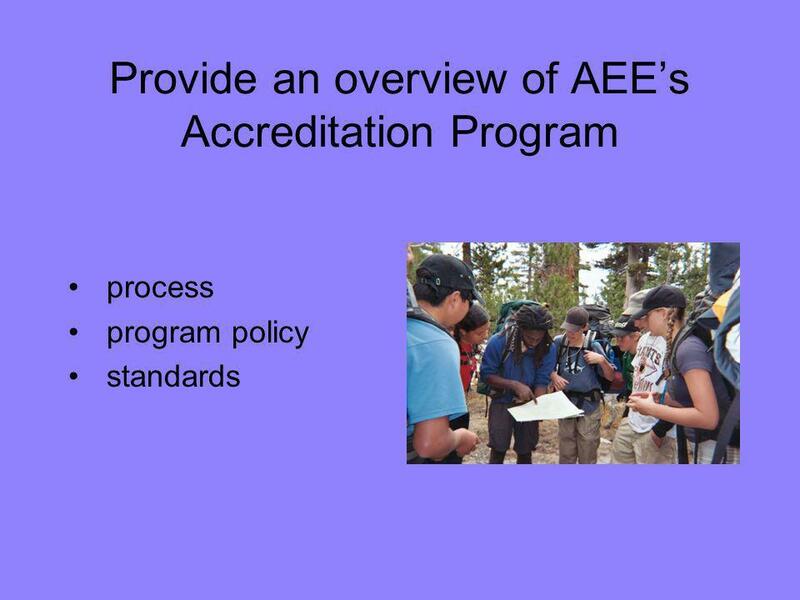 Provide an overview of AEEs Accreditation Program process program policy standards. 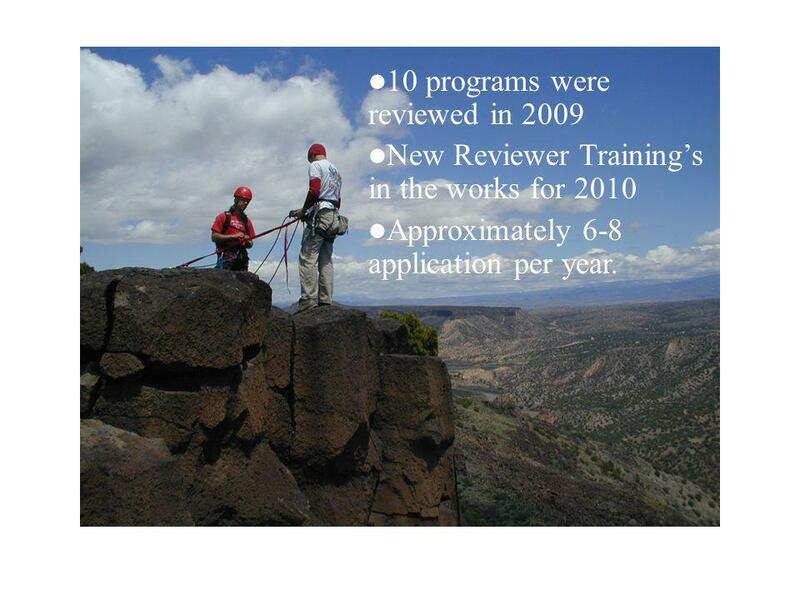 5 10 programs were reviewed in 2009 New Reviewer Trainings in the works for 2010 Approximately 6-8 application per year. 8 Improved Quality and Performance Accreditation programs identify quality and performance indicators for organizations through a set of consensus standards.Accreditation programs identify quality and performance indicators for organizations through a set of consensus standards. Accredited organizations demonstrate the progress of an advancing field through increased professionalism, greater consistency and improved practices.Accredited organizations demonstrate the progress of an advancing field through increased professionalism, greater consistency and improved practices. 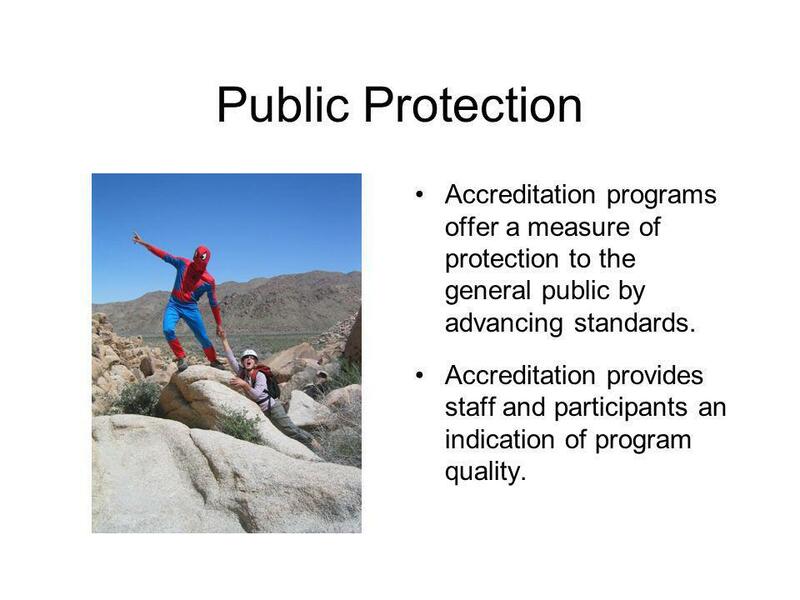 9 Public Protection Accreditation programs offer a measure of protection to the general public by advancing standards. 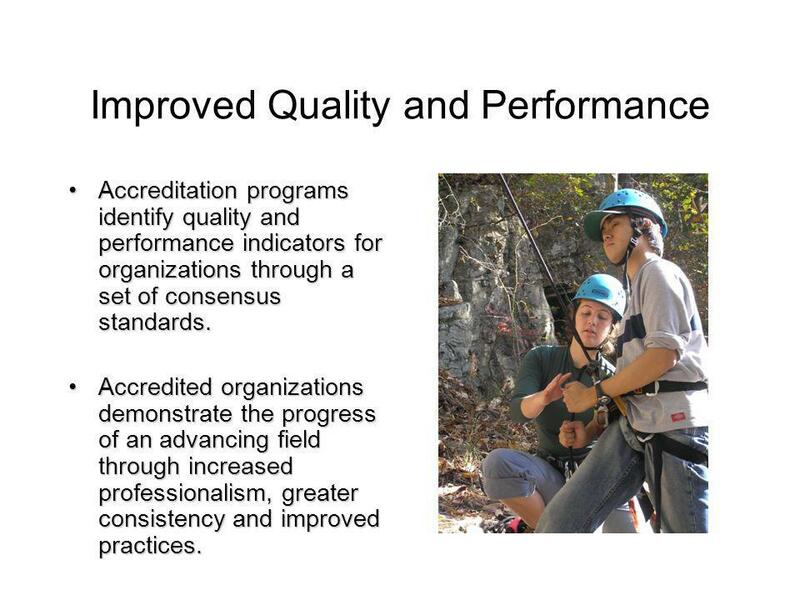 Accreditation provides staff and participants an indication of program quality. 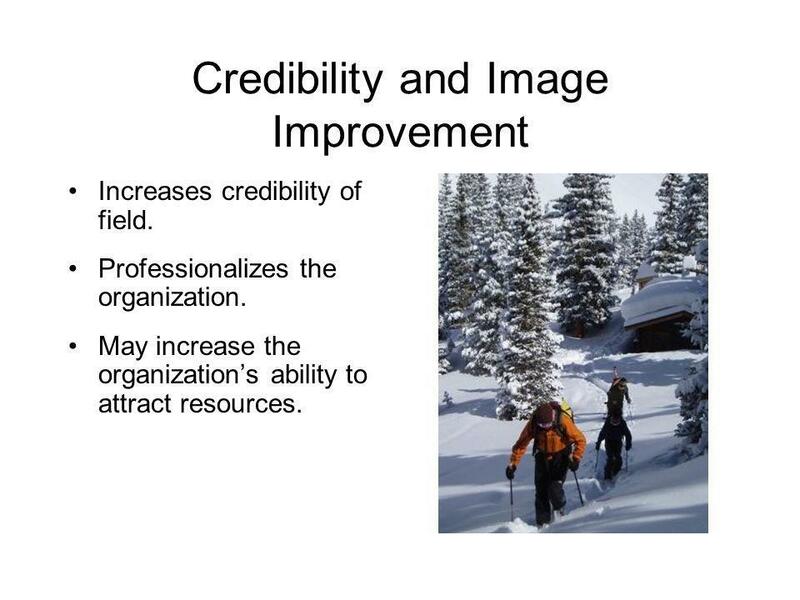 10 Credibility and Image Improvement Increases credibility of field. Professionalizes the organization. May increase the organizations ability to attract resources. 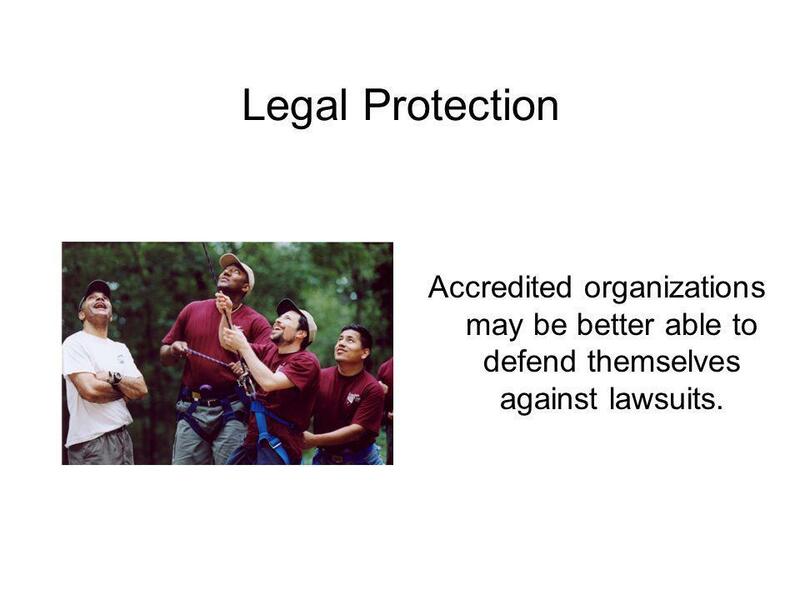 11 Legal Protection Accredited organizations may be better able to defend themselves against lawsuits. 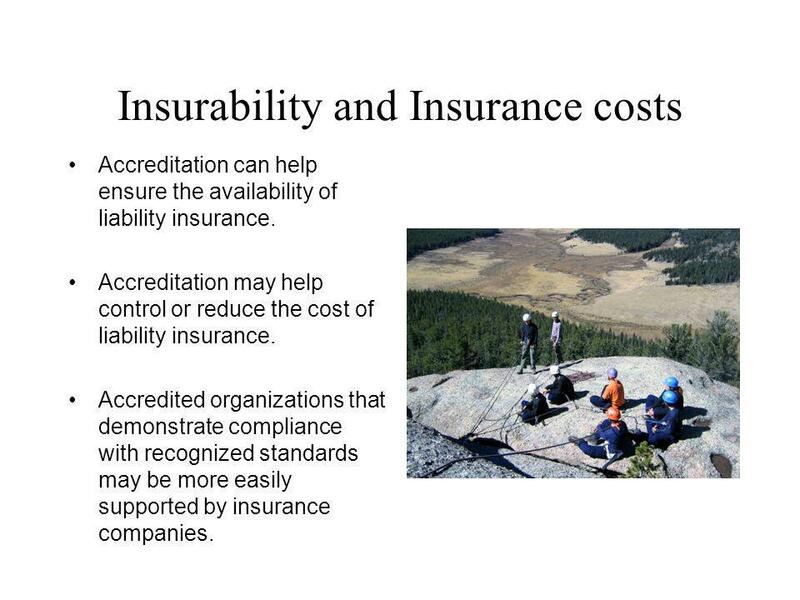 12 Insurability and Insurance costs Accreditation can help ensure the availability of liability insurance. 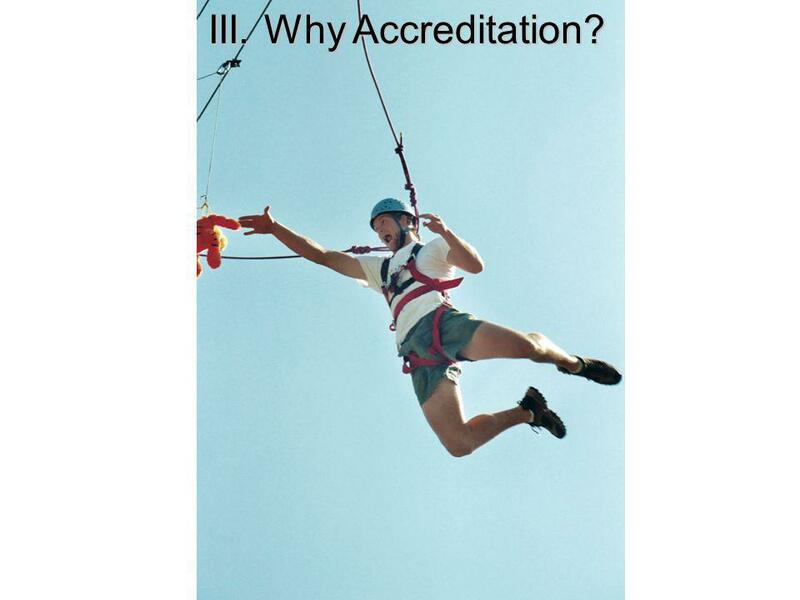 Accreditation may help control or reduce the cost of liability insurance. Accredited organizations that demonstrate compliance with recognized standards may be more easily supported by insurance companies. 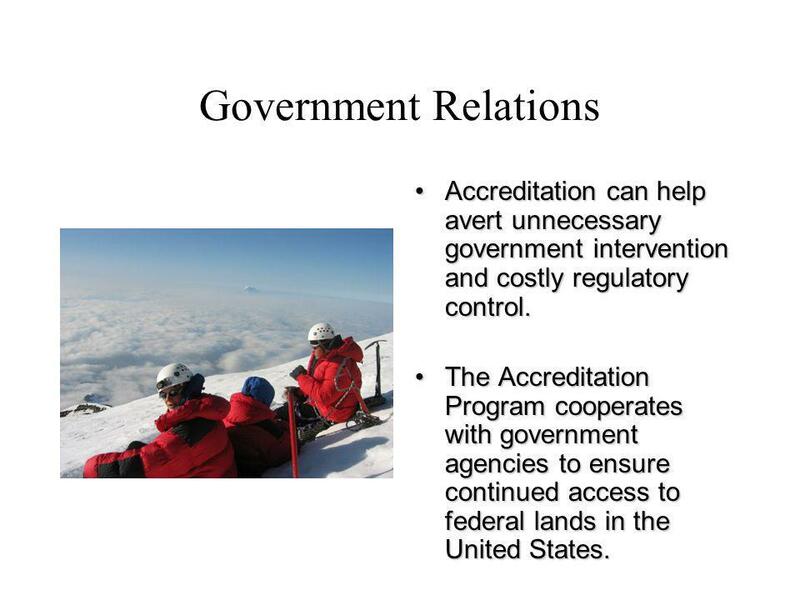 13 Government Relations Accreditation can help avert unnecessary government intervention and costly regulatory control.Accreditation can help avert unnecessary government intervention and costly regulatory control. 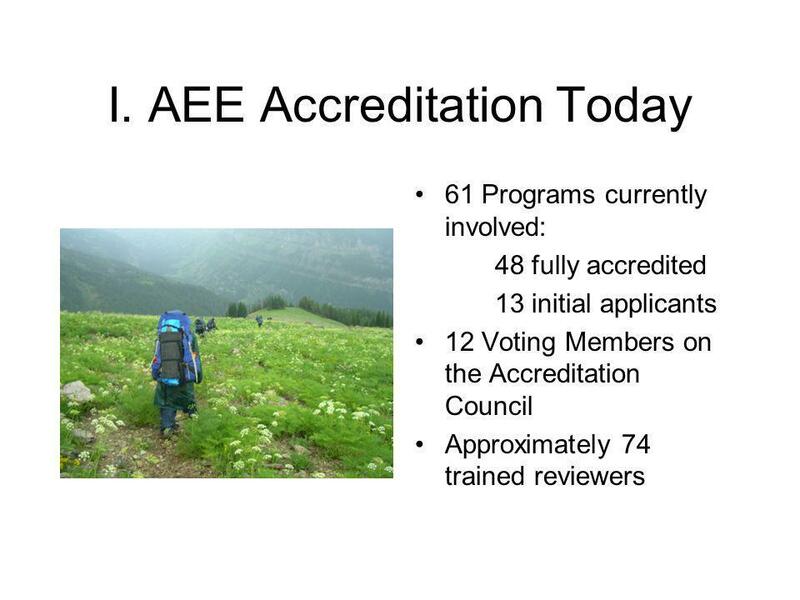 The Accreditation Program cooperates with government agencies to ensure continued access to federal lands in the United States.The Accreditation Program cooperates with government agencies to ensure continued access to federal lands in the United States. 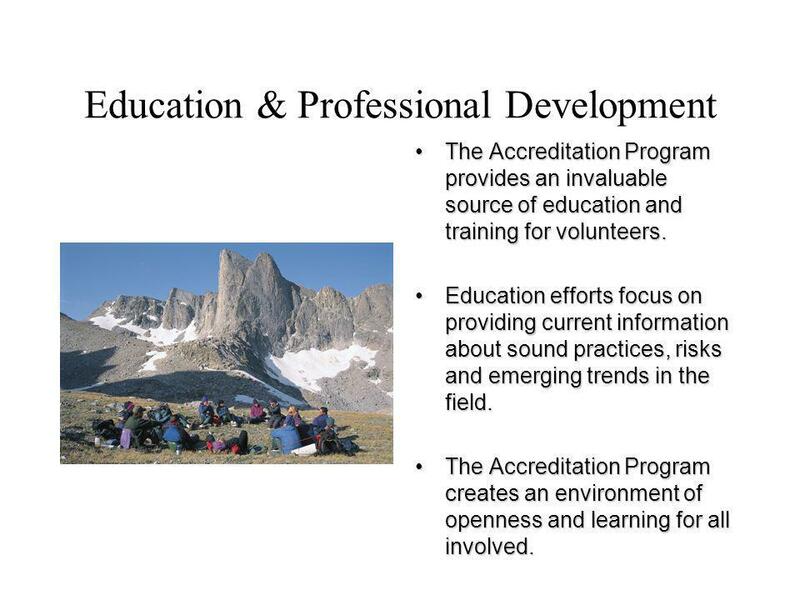 14 Education & Professional Development The Accreditation Program provides an invaluable source of education and training for volunteers.The Accreditation Program provides an invaluable source of education and training for volunteers. Education efforts focus on providing current information about sound practices, risks and emerging trends in the field.Education efforts focus on providing current information about sound practices, risks and emerging trends in the field. The Accreditation Program creates an environment of openness and learning for all involved.The Accreditation Program creates an environment of openness and learning for all involved. 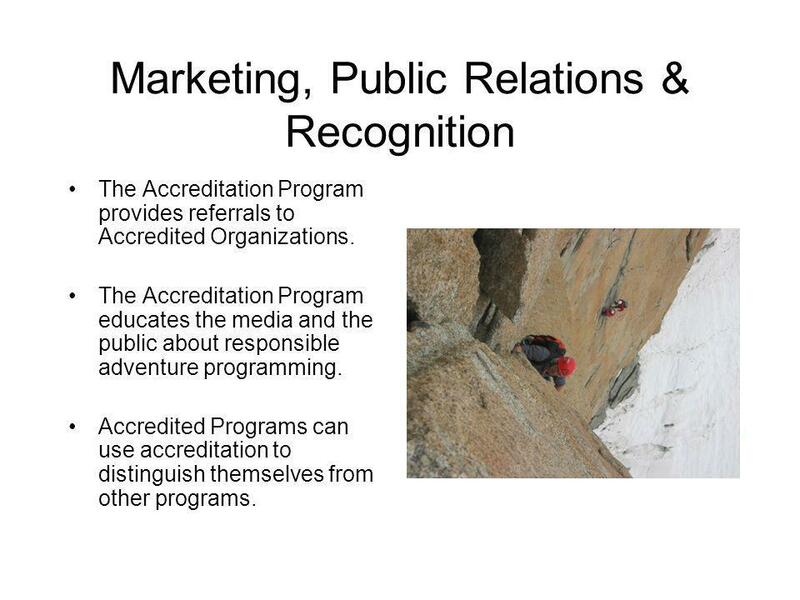 15 Marketing, Public Relations & Recognition The Accreditation Program provides referrals to Accredited Organizations. 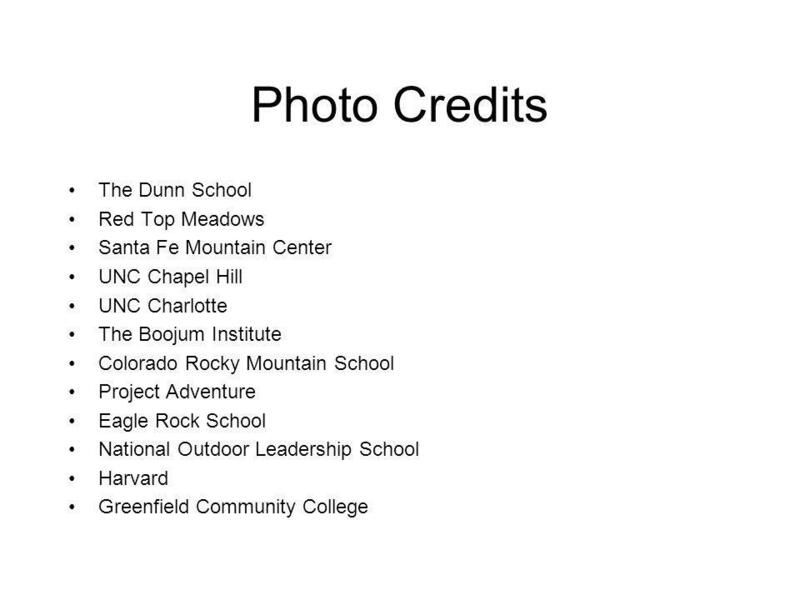 The Accreditation Program educates the media and the public about responsible adventure programming. 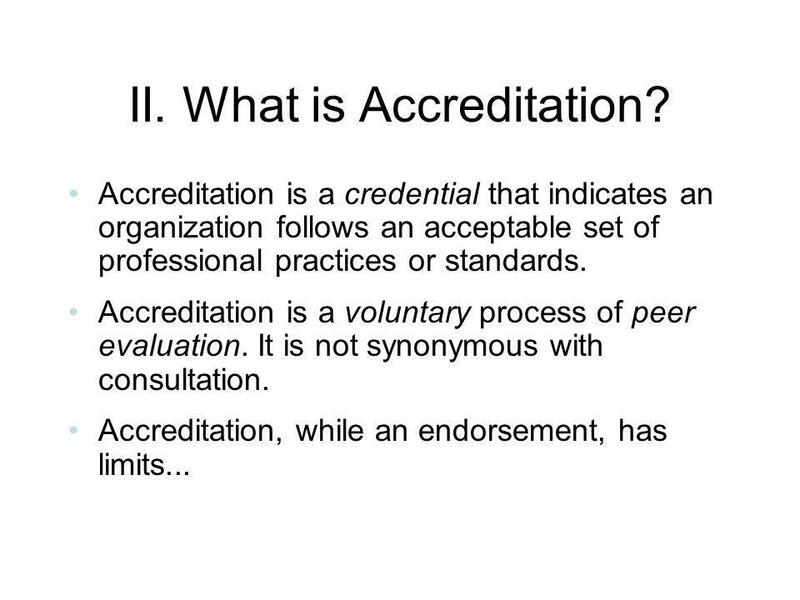 Accredited Programs can use accreditation to distinguish themselves from other programs. 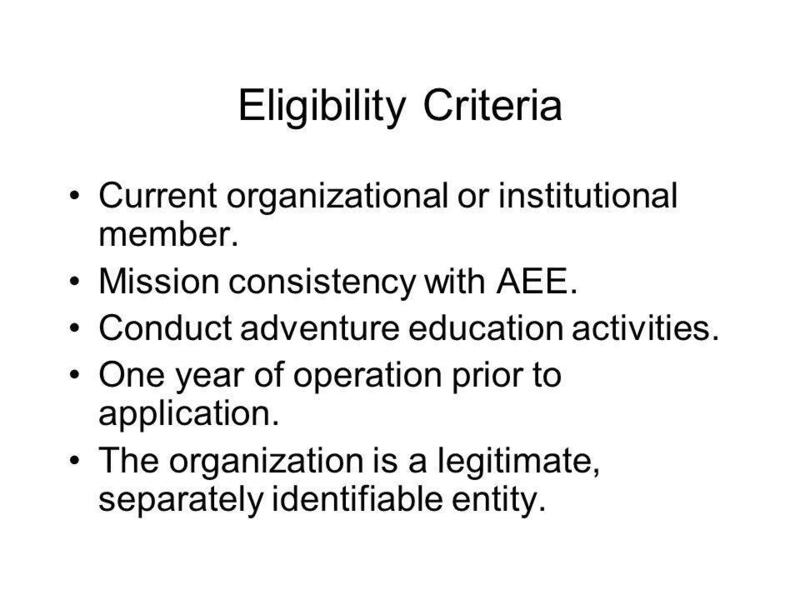 17 Eligibility Criteria Current organizational or institutional member. Mission consistency with AEE. 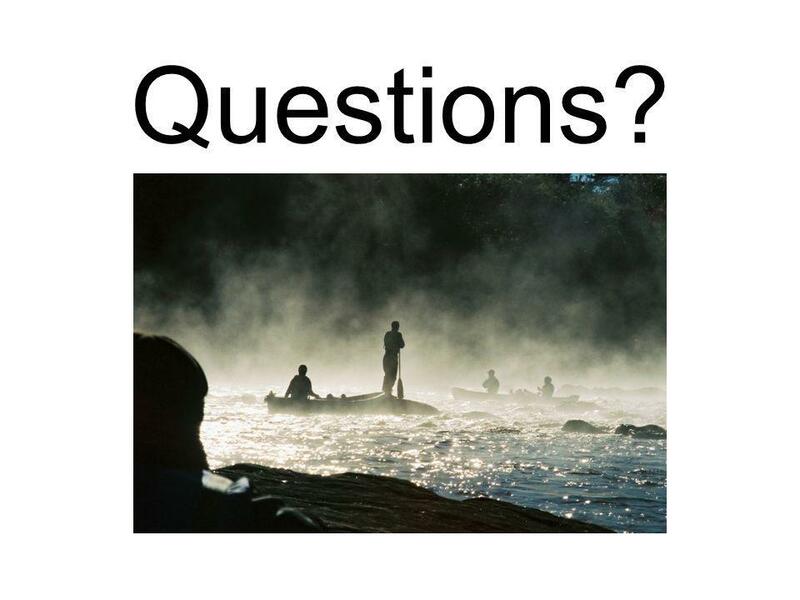 Conduct adventure education activities. One year of operation prior to application. The organization is a legitimate, separately identifiable entity. 18 The Process – Eligibility Step 1. 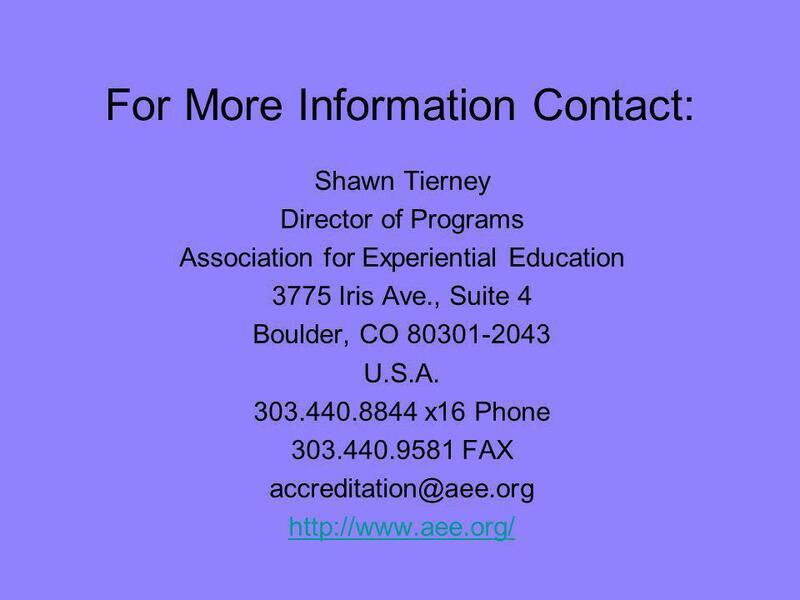 Request information from AEE. Step 2. Submit the preliminary application. Step 3. Pay accreditation application fee. If applicable. Step 4. 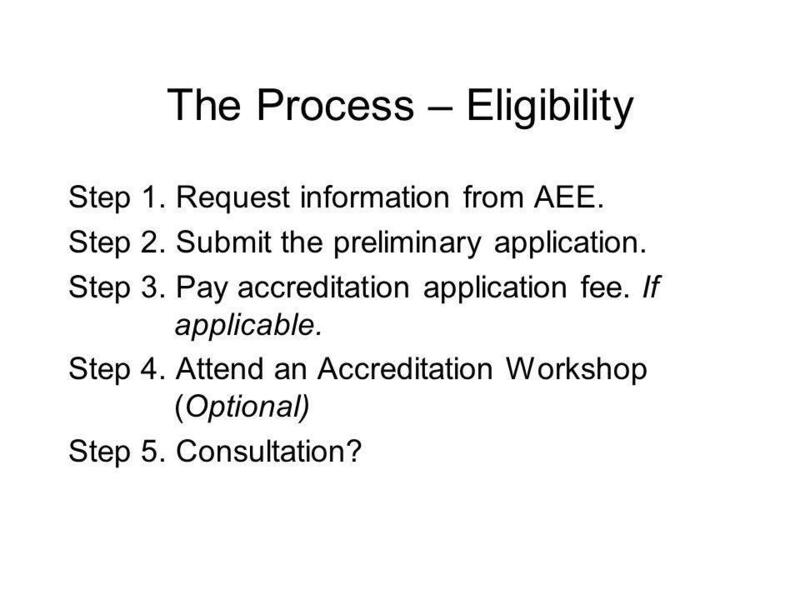 Attend an Accreditation Workshop (Optional) Step 5. Consultation? 19 The Process – Internal Review Step 6. 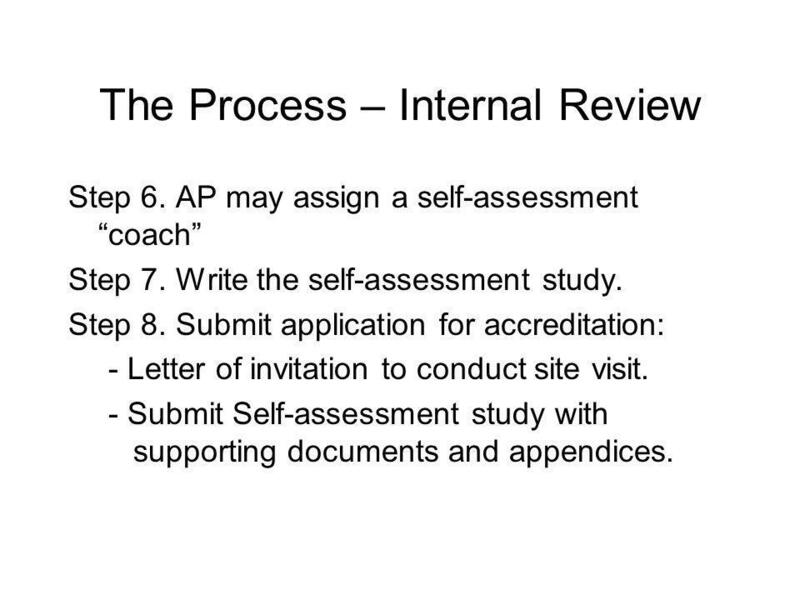 AP may assign a self-assessment coach Step 7. Write the self-assessment study. Step 8. Submit application for accreditation: - Letter of invitation to conduct site visit. - Submit Self-assessment study with supporting documents and appendices. 20 The Process – External Review Step 9. 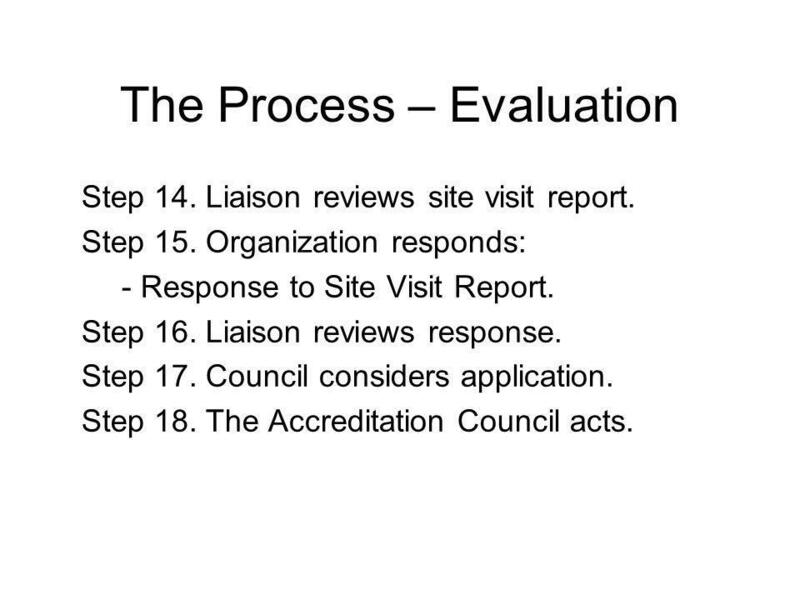 Designate a Liaison from Accreditation Council. Step 10. 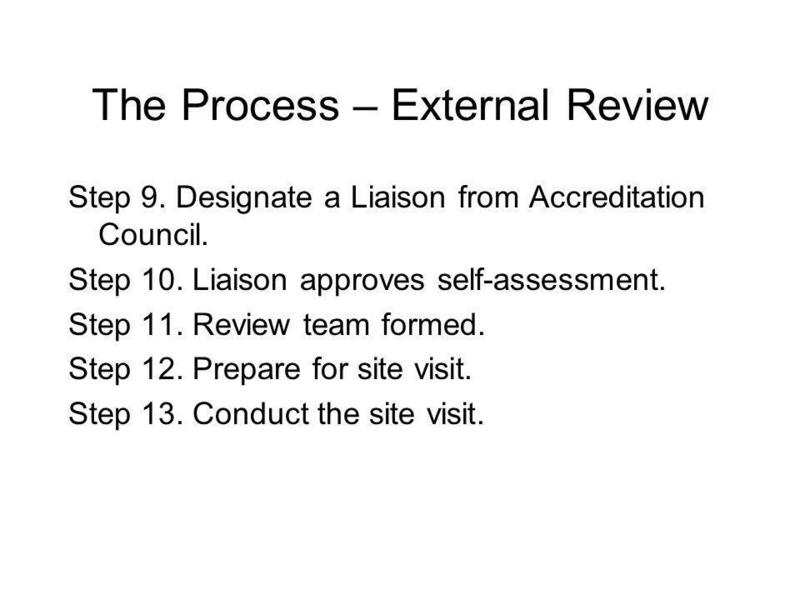 Liaison approves self-assessment. Step 11. Review team formed. Step 12. Prepare for site visit. Step 13. Conduct the site visit. 21 The Process – Evaluation Step 14. Liaison reviews site visit report. Step 15. Organization responds: - Response to Site Visit Report. Step 16. Liaison reviews response. Step 17. Council considers application. Step 18. 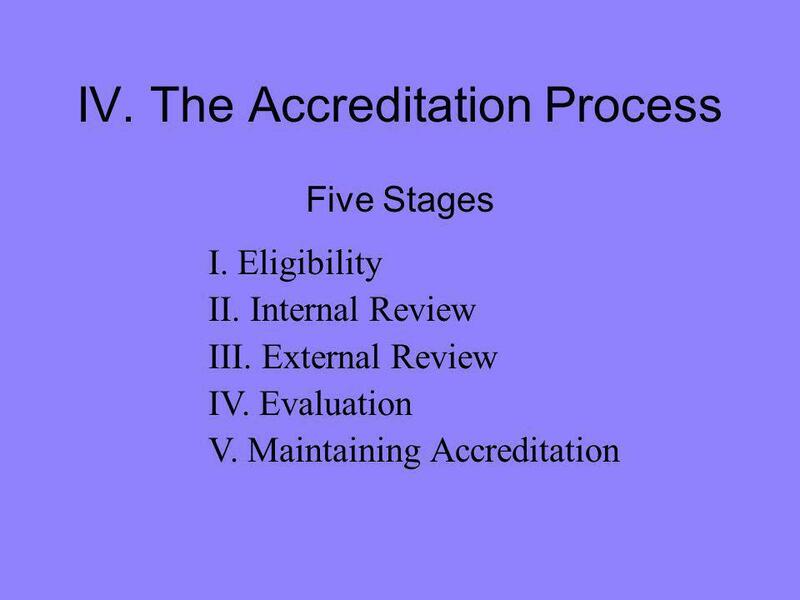 The Accreditation Council acts. 22 The Process – Maintenance Step 19. 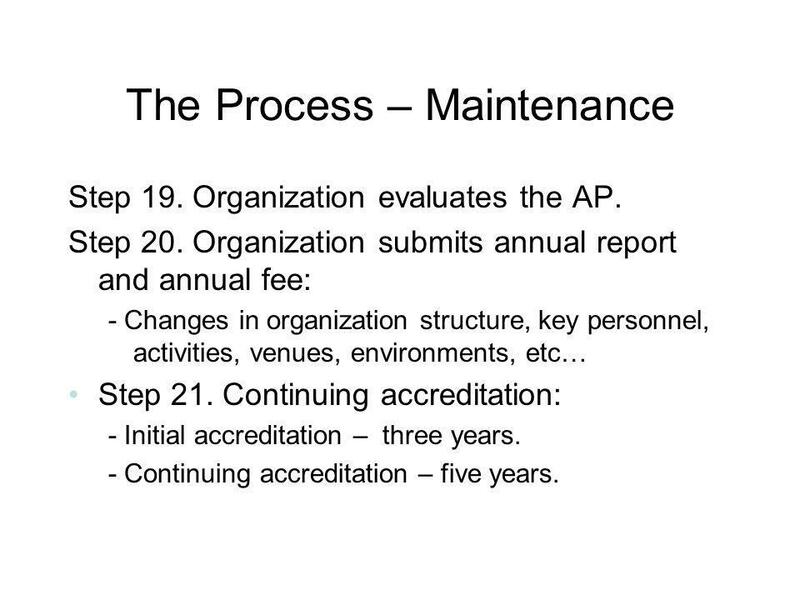 Organization evaluates the AP. Step 20. Organization submits annual report and annual fee: - Changes in organization structure, key personnel, activities, venues, environments, etc… Step 21. Continuing accreditation: - Initial accreditation – three years. - Continuing accreditation – five years. 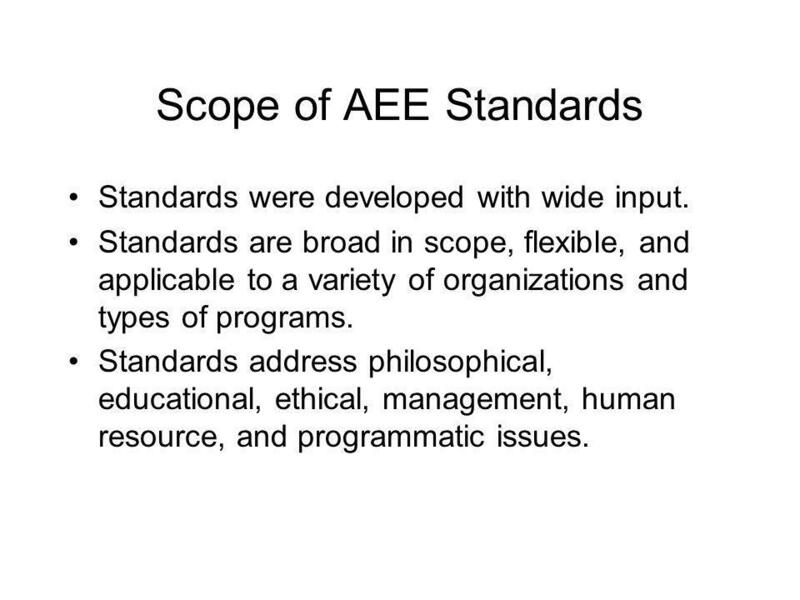 26 Scope of AEE Standards Standards were developed with wide input. 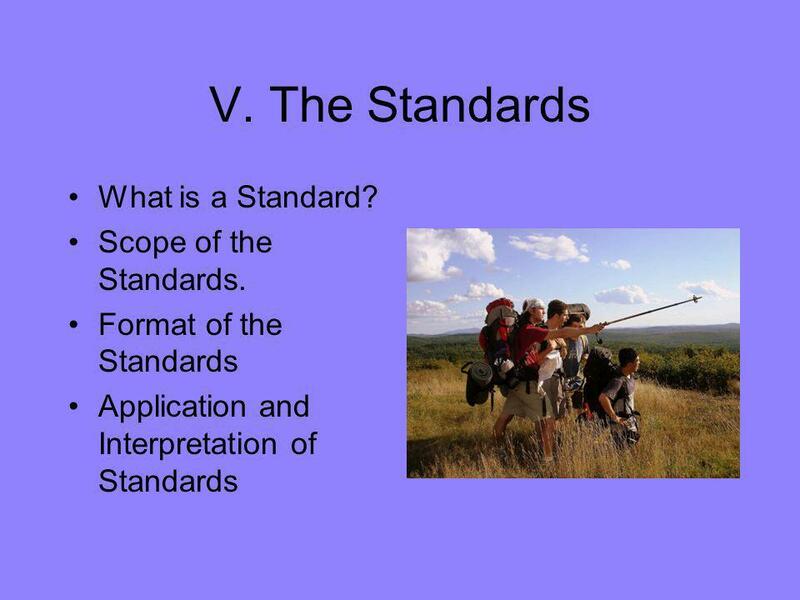 Standards are broad in scope, flexible, and applicable to a variety of organizations and types of programs. 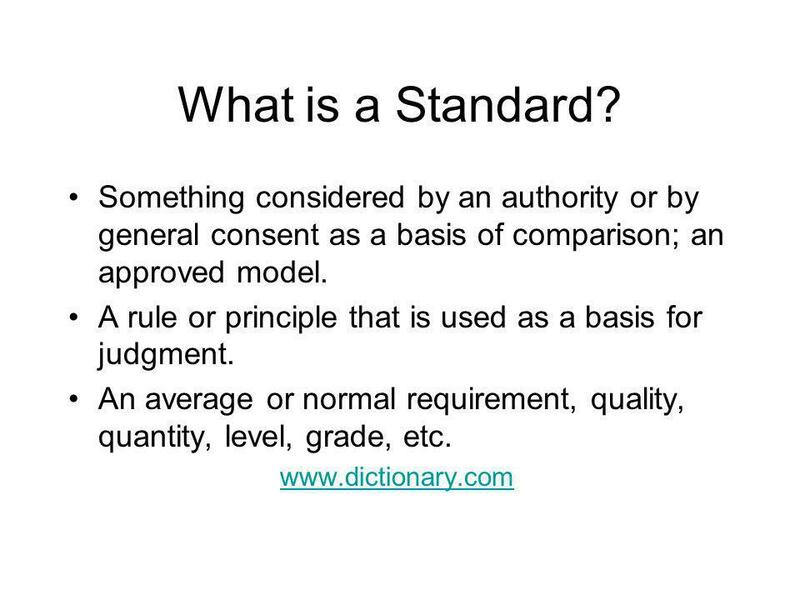 Standards address philosophical, educational, ethical, management, human resource, and programmatic issues. 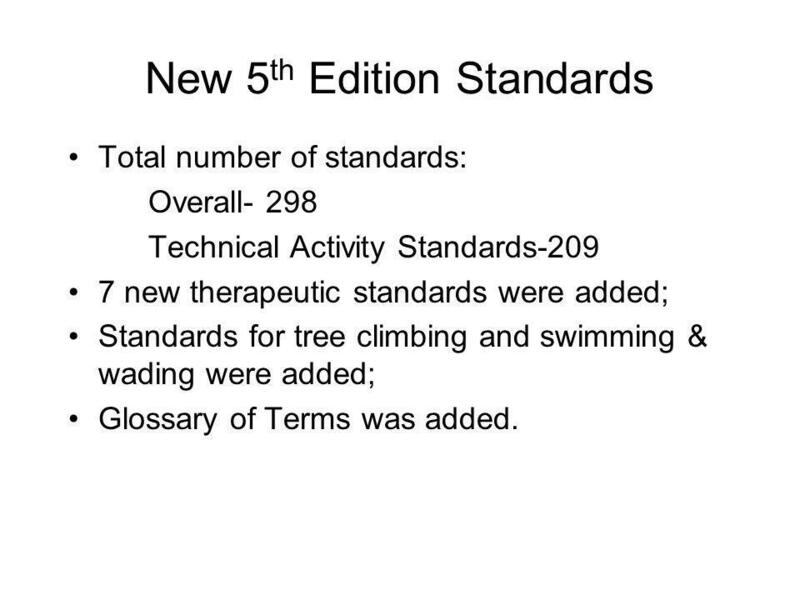 27 New 5 th Edition Standards Total number of standards: Overall- 298 Technical Activity Standards-209 7 new therapeutic standards were added; Standards for tree climbing and swimming & wading were added; Glossary of Terms was added. 28 Format of The Standards Five chapters with thirty-one separate sections. 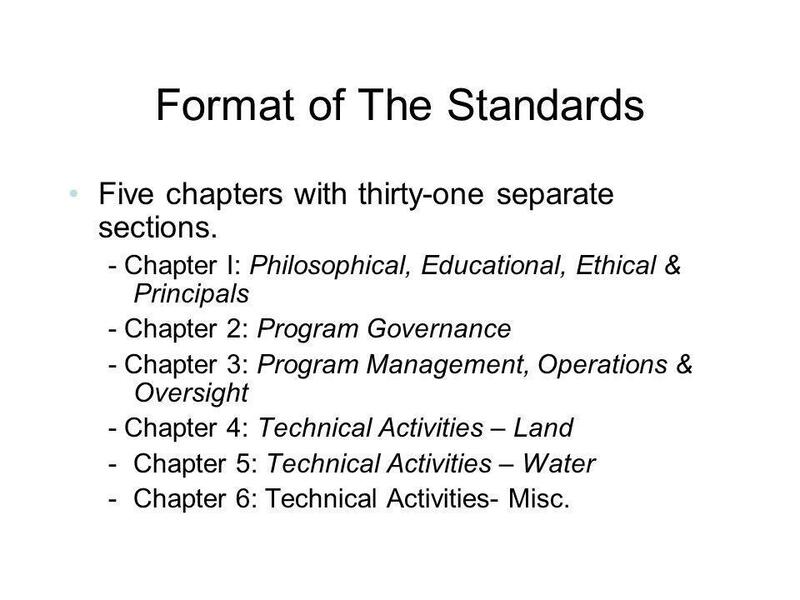 - Chapter I: Philosophical, Educational, Ethical & Principals - Chapter 2: Program Governance - Chapter 3: Program Management, Operations & Oversight - Chapter 4: Technical Activities – Land -Chapter 5: Technical Activities – Water -Chapter 6: Technical Activities- Misc. 29 Standards are listed in bold and state the criteria that must be met. 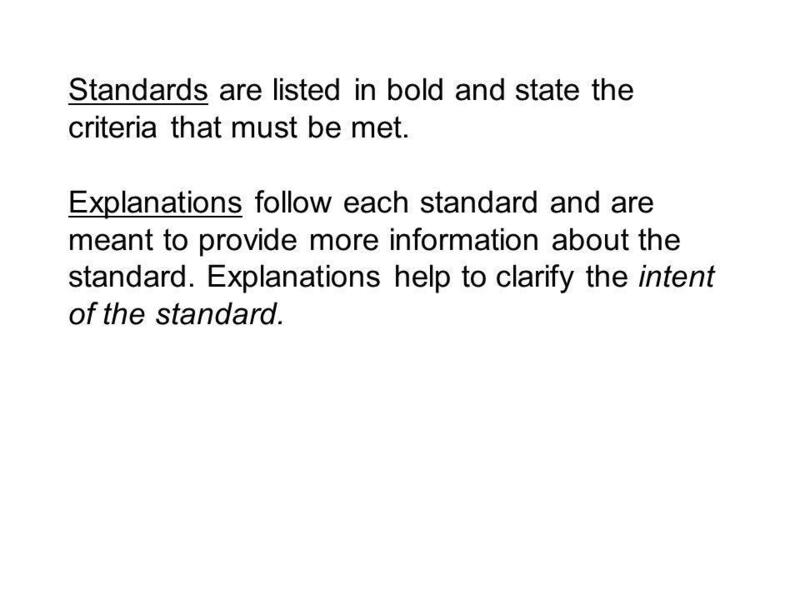 Explanations follow each standard and are meant to provide more information about the standard. Explanations help to clarify the intent of the standard. 30 Some Examples Section 1. 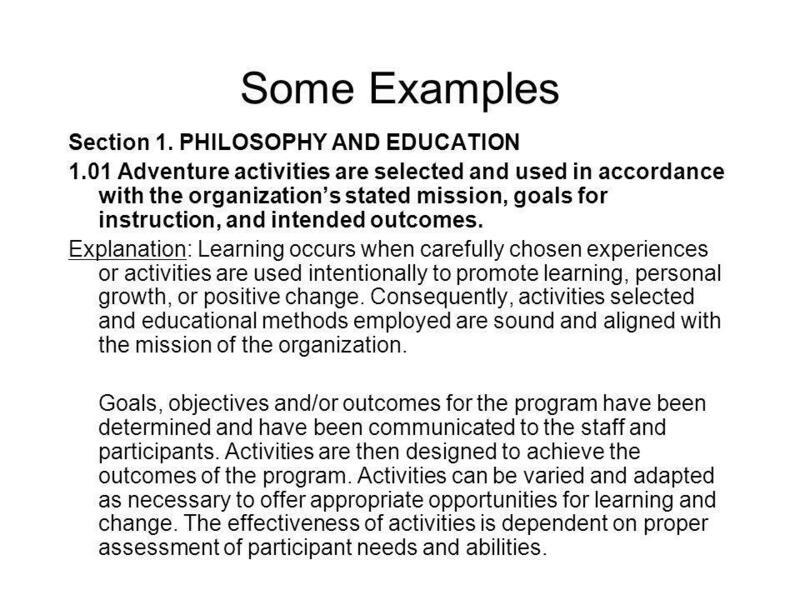 PHILOSOPHY AND EDUCATION 1.01 Adventure activities are selected and used in accordance with the organizations stated mission, goals for instruction, and intended outcomes. Explanation: Learning occurs when carefully chosen experiences or activities are used intentionally to promote learning, personal growth, or positive change. Consequently, activities selected and educational methods employed are sound and aligned with the mission of the organization. Goals, objectives and/or outcomes for the program have been determined and have been communicated to the staff and participants. Activities are then designed to achieve the outcomes of the program. Activities can be varied and adapted as necessary to offer appropriate opportunities for learning and change. The effectiveness of activities is dependent on proper assessment of participant needs and abilities. 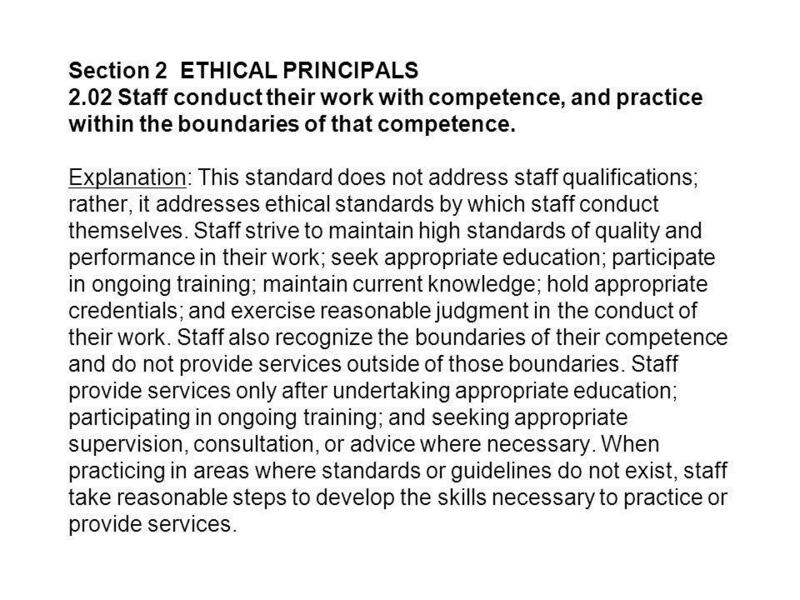 31 Section 2 ETHICAL PRINCIPALS 2.02 Staff conduct their work with competence, and practice within the boundaries of that competence. Explanation: This standard does not address staff qualifications; rather, it addresses ethical standards by which staff conduct themselves. Staff strive to maintain high standards of quality and performance in their work; seek appropriate education; participate in ongoing training; maintain current knowledge; hold appropriate credentials; and exercise reasonable judgment in the conduct of their work. Staff also recognize the boundaries of their competence and do not provide services outside of those boundaries. Staff provide services only after undertaking appropriate education; participating in ongoing training; and seeking appropriate supervision, consultation, or advice where necessary. When practicing in areas where standards or guidelines do not exist, staff take reasonable steps to develop the skills necessary to practice or provide services. 32 Section 3. 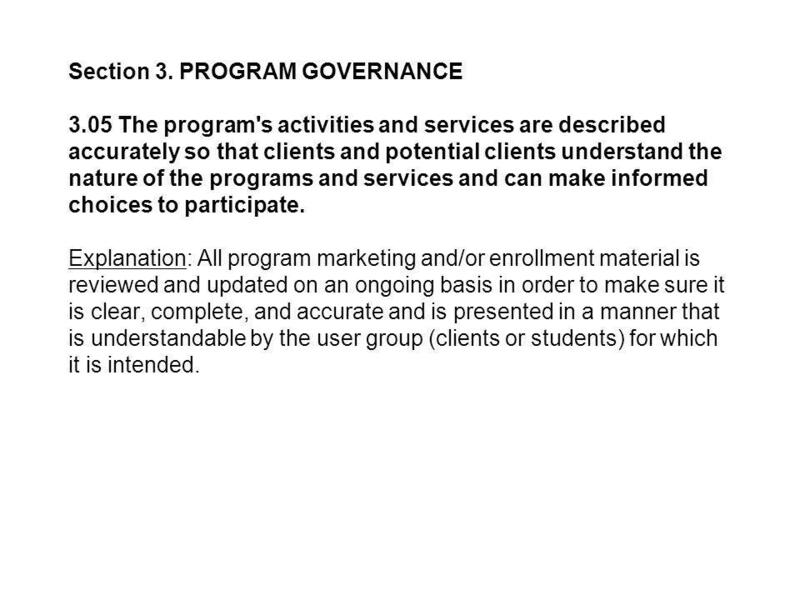 PROGRAM GOVERNANCE 3.05 The program's activities and services are described accurately so that clients and potential clients understand the nature of the programs and services and can make informed choices to participate. Explanation: All program marketing and/or enrollment material is reviewed and updated on an ongoing basis in order to make sure it is clear, complete, and accurate and is presented in a manner that is understandable by the user group (clients or students) for which it is intended. 33 Section 4. 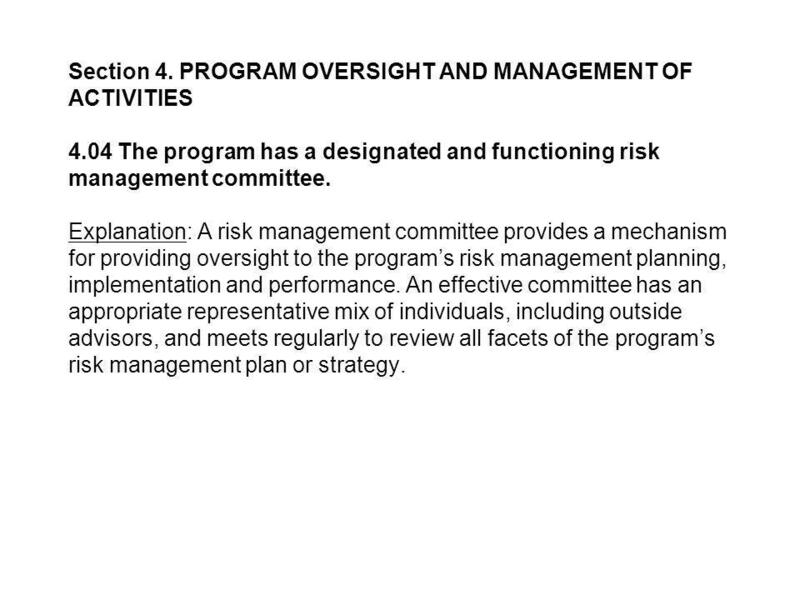 PROGRAM OVERSIGHT AND MANAGEMENT OF ACTIVITIES 4.04 The program has a designated and functioning risk management committee. Explanation: A risk management committee provides a mechanism for providing oversight to the programs risk management planning, implementation and performance. An effective committee has an appropriate representative mix of individuals, including outside advisors, and meets regularly to review all facets of the programs risk management plan or strategy. 34 Section 12. CLIMBING ACTIVITIES 12.01 The program has written policies and procedures for the conduct of climbing. Explanation: Specific guidelines that staff and/or participants are expected to follow – such as supervision requirements, equipment requirements, types of anchors, use of helmets, and working near edges – are easily accessible to and used by all staff and participants. 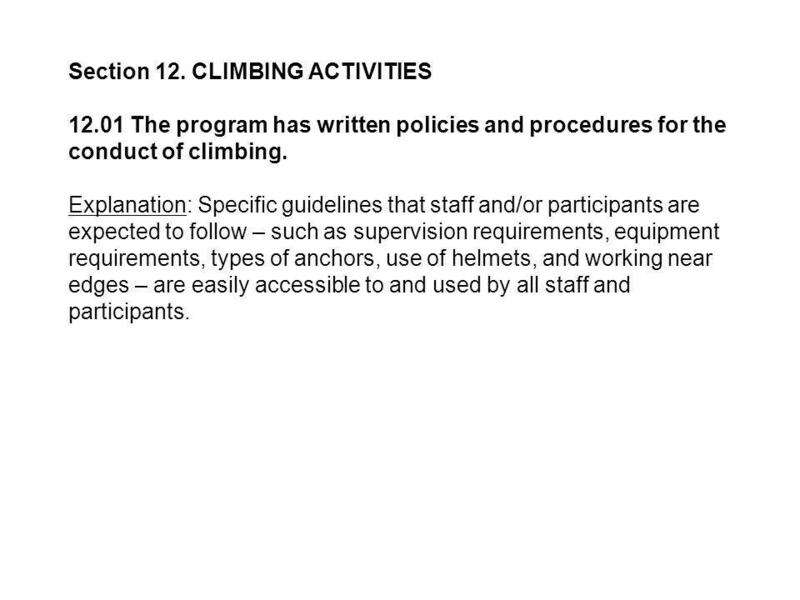 35 12.02 The program has an explicit and appropriate curriculum for climbing. Explanation: There are explicit educational or instructional objectives for this activity that address topics or skills taught, expected participant standards of performance, and appropriate assessment of participant abilities and understanding. 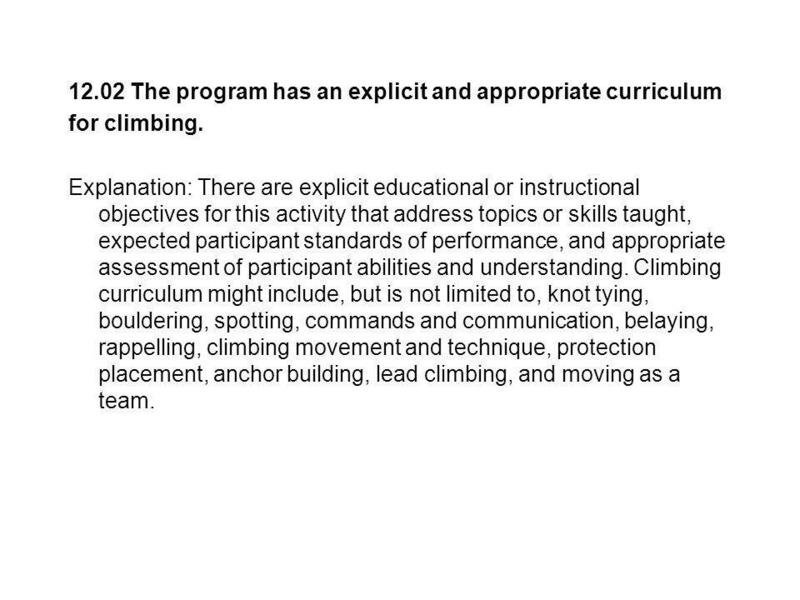 Climbing curriculum might include, but is not limited to, knot tying, bouldering, spotting, commands and communication, belaying, rappelling, climbing movement and technique, protection placement, anchor building, lead climbing, and moving as a team. 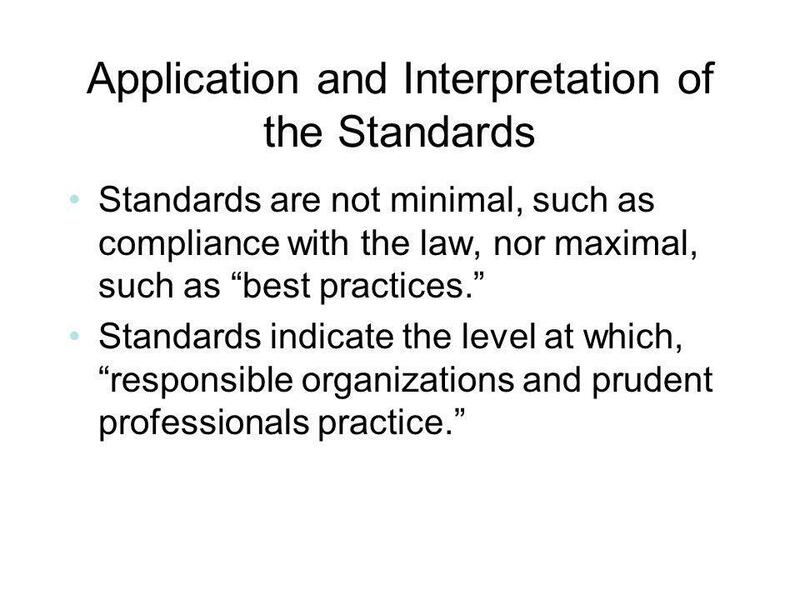 36 Application and Interpretation of the Standards Standards are not minimal, such as compliance with the law, nor maximal, such as best practices. Standards indicate the level at which, responsible organizations and prudent professionals practice. 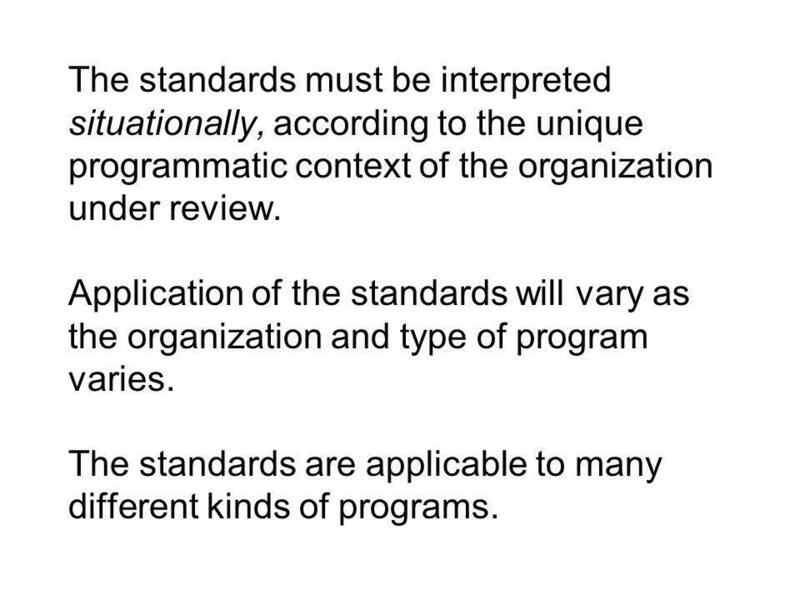 37 The standards must be interpreted situationally, according to the unique programmatic context of the organization under review. Application of the standards will vary as the organization and type of program varies. The standards are applicable to many different kinds of programs. 38 What is important in interpreting and applying the standards is the concept of sufficiency or meeting the intent of a standard in a given situation. 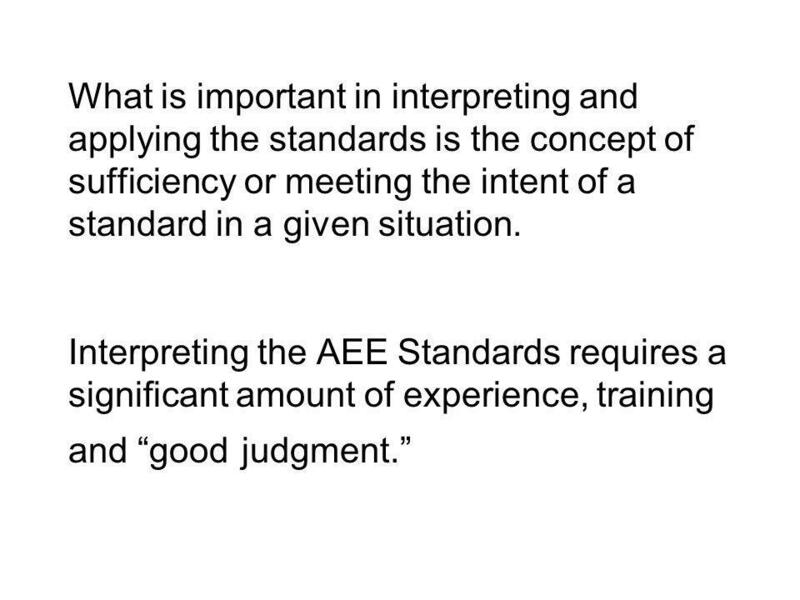 Interpreting the AEE Standards requires a significant amount of experience, training and good judgment. 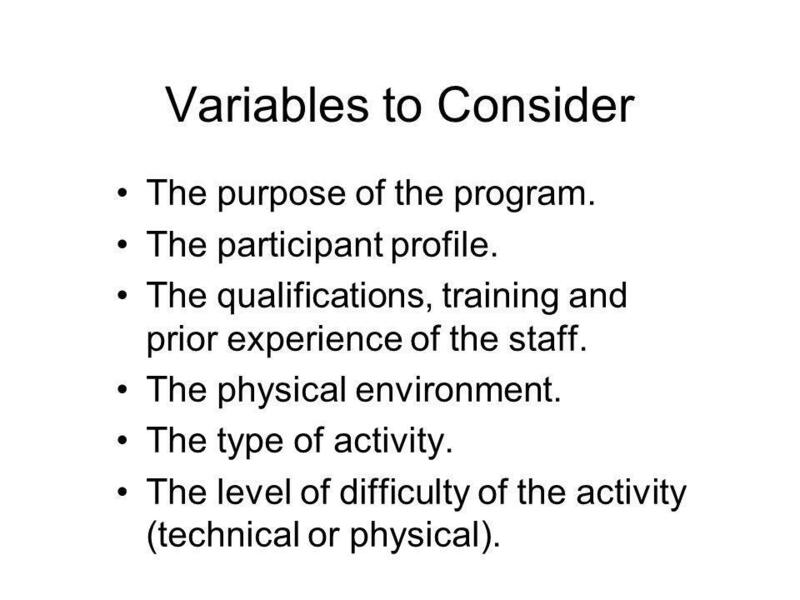 39 Variables to Consider The purpose of the program. The participant profile. The qualifications, training and prior experience of the staff. The physical environment. The type of activity. The level of difficulty of the activity (technical or physical). 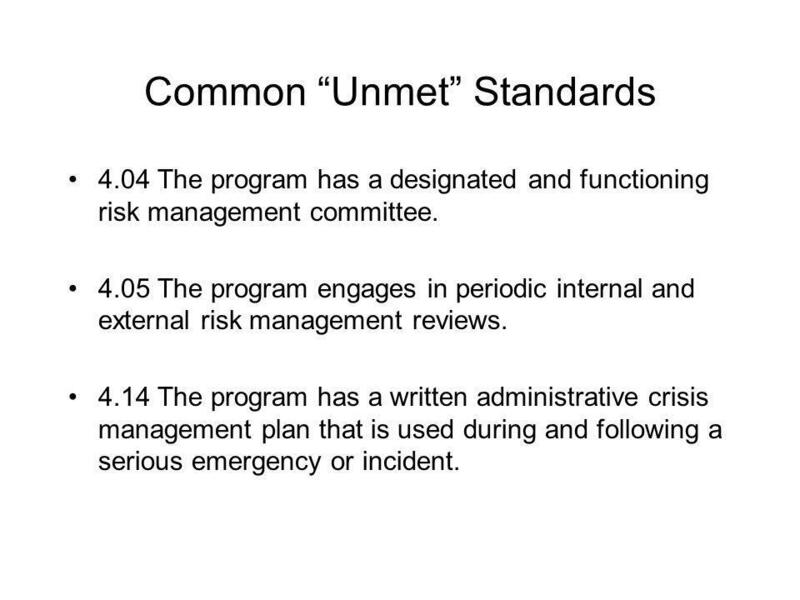 40 Common Unmet Standards 4.04 The program has a designated and functioning risk management committee. 4.05 The program engages in periodic internal and external risk management reviews. 4.14 The program has a written administrative crisis management plan that is used during and following a serious emergency or incident. 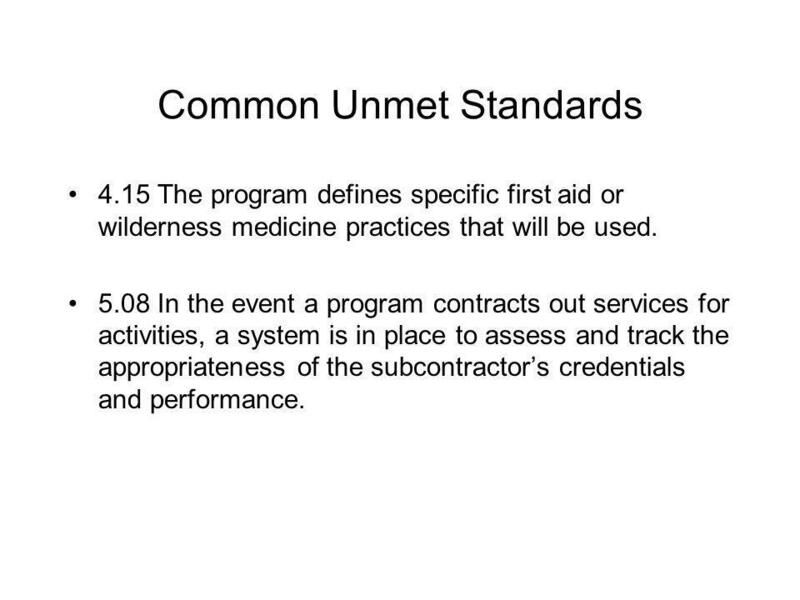 41 Common Unmet Standards 4.15 The program defines specific first aid or wilderness medicine practices that will be used. 5.08 In the event a program contracts out services for activities, a system is in place to assess and track the appropriateness of the subcontractors credentials and performance. 43 VI. How to Get Involved... Apply for Accreditation! - Submit a Preliminary Application for Accreditation. 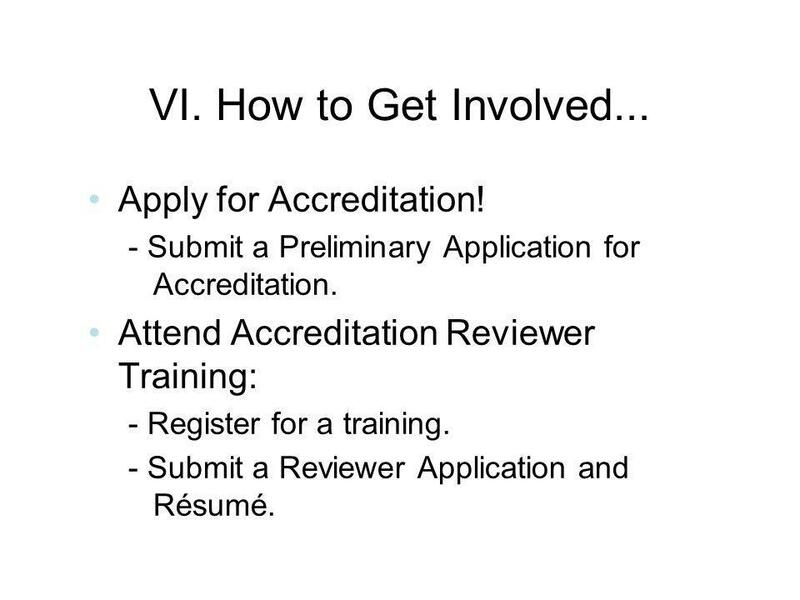 Attend Accreditation Reviewer Training: - Register for a training. - Submit a Reviewer Application and Résumé. 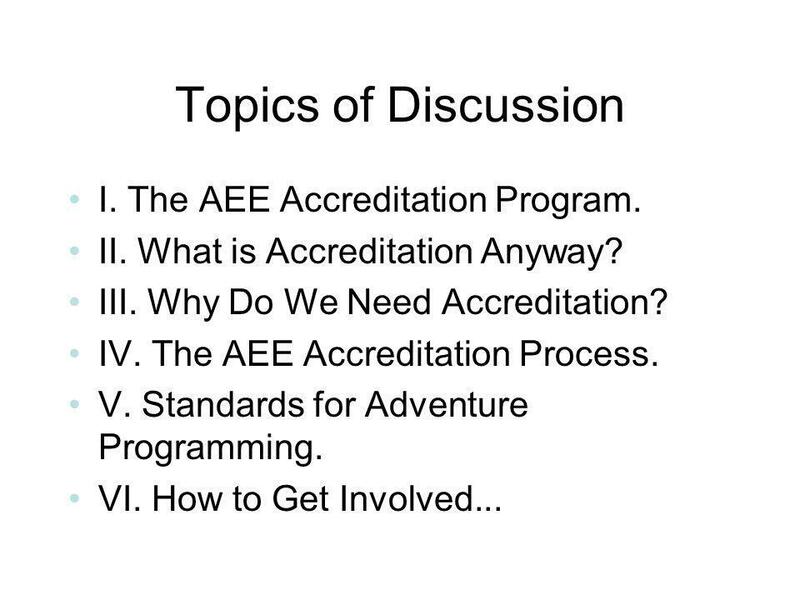 Download ppt "AEE Accreditation Program. 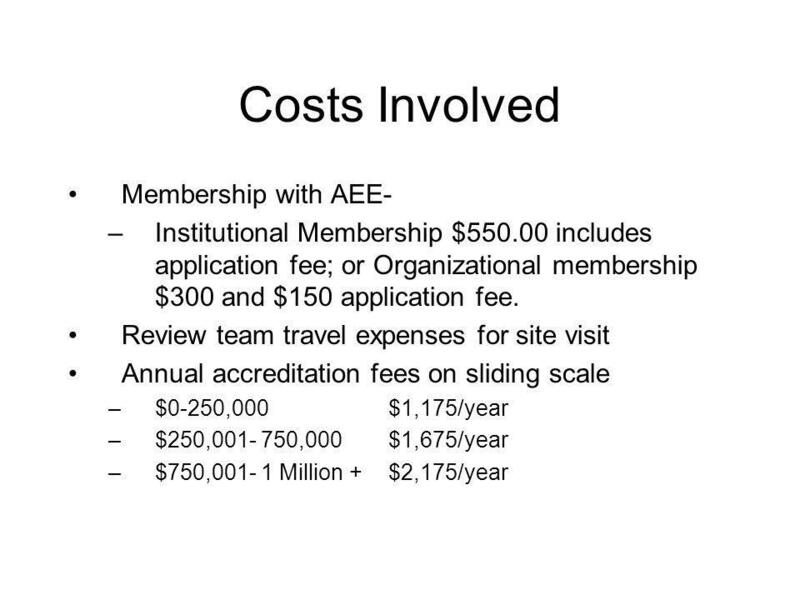 Provide an overview of AEEs Accreditation Program process program policy standards."